I don’t often get to visit with Extraordinary Lutheran Ministries (ELM) volunteers in my living room, but we accomplished that yesterday with our first ever “web-chat” for ELM program and committee volunteers. Fantastic! ELM Program Director Pastor Jen Rude pitched this idea earlier this year, calling it a “state of the state” for the people committing a great deal of time and energy into ELM. Since our volunteers are located all over the country and often working on very specific areas, we wanted to give them a glimpse into what else is happening with ELM. We were able to use video chat technology (which we get through a wonderful donation from Citrix GoTo Meeting via the fabulous nonprofit tech site, Tech Soup) to bring us a bit closer together than the phone allows. 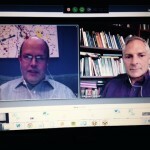 ELM Board Co-Chairs, Jim Kowalski (left) and Pastor Mike Wilker on the ELM Volunteer Web-chat. Jen invited ELM Board Chairs, Jim Kowalski and Pastor Mike Wilker; along with our three program conveners, Pastor Caleb Crainer (Proclaim); Margaret Moreland (Ministry Engagement); and Pastor Randy Nelson (Candidacy Accompaniment) to give an overview of the last year of our three core programs. She also invited Kyle Severson, who has served as the convener of the Proclaim Seminarians Team (created because of the growing number of LGBTQ seminarians joining Proclaim). Jen and I were also on hand to give some general overviews of the last year for Extraordinary Lutheran Ministries. A new Proclaim project is “First Friday Faithful & Fabulous Forums” – a chance for Proclaim folks to gather regularly throughout the year. Caleb also said his thanks (and we said ours!) as he is ending two years in this role and welcoming Pastor Emily Ewing as the new Proclaim convener. Candidacy Accompaniment is continuing to focus on the needs of candidates, with a growing focus on support for those awaiting first call – as well as those who are in the first few years of a new call. This month, Ministry Engagement launched one of their new projects – an ELM presence at synod assemblies. Margaret Moreland had a great visit at the Rocky Mountain Synod Assembly. ELM will also be at the upcoming Minneapolis Area, Metro Chicago, and Sierra Pacific Synod Assemblies. The Proclaim Seminarians Team has helped create a growing presence for Proclaim at our ELCA seminaries (and a few other divinity schools). We use web-chats for our board, program, and committee work, and Proclaim regularly uses web-chats to gather for conversations and meetings. Yesterday was a fun chance to connect across the miles and we plan to host more of these for volunteers and other ELM friends in the future. I hope to see you on one! This entry was posted on Wednesday, May 13th, 2015 at 10:19 am	and is filed under Blog. You can follow any responses to this entry through the RSS 2.0 feed. Both comments and pings are currently closed.